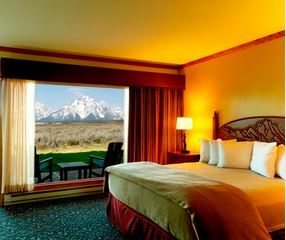 Jackson Lake Lodge, located in a beautiful location less than 5 minutes from Jackson Lake, is a truly breathtaking lodge within the Grand Teton Park known for its iconic views of the Teton Mountain Range. 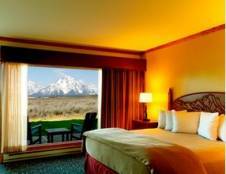 The 60-foot floor to ceiling windows gives visitors one of the most awe-inspiring views of the famed mountains and its luxurious guest rooms provide the utmost level of comfort and relaxation. There are 385 rooms including stunning suites, main lodge rooms and quiet cottages with a view and non-view options. 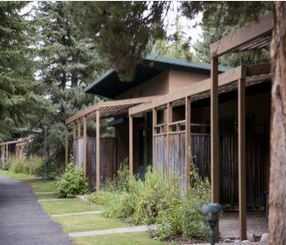 Within the lodge, amenities include a variety of dining options, meeting space, retail shops, swimming pool and an exhibit featuring Native American artifacts and Western art. On-site recreation guides are happy to help you and your family plan your perfect Wyoming excursion including horseback riding, river rafting, boat cruises, narrated tours, kayak, canoe, and motorboat rentals, fishing, hiking and golfing. Dining at the Jackson Lake Lodge is an experience in and of itself with cuisine that makes sure it is not upstaged by the scenery and diners can enjoy beautiful views right from their table. Known for its commitment to its Sustainable Stay Program as an eco-friendly hotel, the restaurant also features healthy menus created from the local and sustainable fare. The menu offers a variety of sustainable, organic, free-range and hormone-free meats and seafood. 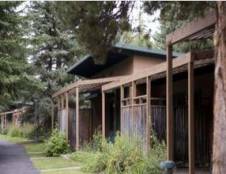 Jackson Lake Lodge is seasonally open from mid-May through the beginning of October.